Vol 4 | Issue 2 | May – Aug 2018 | page: 29-33 | Wasudeo mahadeo Gadegone, Bhaskaran Shivashankar, Rajendra Chandak, Piyush Gadegone. Author: Wasudeo mahadeo Gadegone , Bhaskaran Shivashankar , Rajendra Chandak , Piyush Gadegone . Vivek Nagar Mul-Road Chandrapur 442402, Maharashtra, India. Introduction: The aim of the present study was to evaluate the outcomes of displaced intracapsuar fracture neck femur managed by dynamic hip screw (DHS) with derotation screw treated within ten days of injury in patients younger than 60 years. Materials and methods: This was a prospective study, carried out between December 2010 to December 2016. A total of 42 patients younger than 60 yrs of age with displaced intracapsular fracture neck femur (Garden III and IV, Pauwels III, with the comminution) presenting to the hospital within 2-10 days were included in the study. Data analysis and statistical analysis was done by using SPSS using appropriate tests. Results: There were 27 males and 15 females, age ranging from 21 to 60 years (mean42.4±10.2 years). There were twenty seven Garden III while fifteen fractures were Garden IV. In forty fractures (95.2 %) average time to union was 3.7 months [3-5 months]. Radiographic evidence of avascular necrosis was seen in four cases(9.5%) and two patients(4.7%) developed non-union of the fracture .There were no cut-outs and breakage of implant .Two patients developed isolated coxa vara ( 120-124°) with backing of screws. Mean shortening of the injured limb was 2 -4 mm in twenty four patients without any functional impairment. Functional results were evaluated by Harris Hip Score. Excellent results were achieved in thirty four (81%), good/fair in six (14.2%) and poor in two (4.8%)patients. Conclusion: Dynamic Hip Screw (DHS) with derotation screw is a good implant for the fixation of the displaced fracture neck femur with excellent to good radiological and functional outcome. Keywords: Fracture neck femur, transcervical/ subcapital fracture, cannulated cancellous screw, dynamic hip screw, avascular necrosis, nonunion. 2. Deneka DA, Simonian PT, Stankewich CJ, et al ;Biomechanical comparison of internal fixation techniques for the treatment of unstable basicervical femoral neck fractures. J Orthop Trauma. 1997;11:337–343. 4. Makki D, Mohamed AM, Gadiyar R, Patterson M ;Addition of an anti-rotation screw to the dynamic hip screw for femoral neck fractures. Orthopedics. 2013;36:865–868. 5. Bonnaire FA, Weber AT. Analysis of fracture gap changes, dynamic and static stability of different osteosynthetic procedures in the femoral neck. Injury. 2002;33 Suppl 3:C24–C32. 8. Baumgaertner MB, Solberg BD .Awareness of tip-apex distance reduces failure of fixation of trochanteric fractures of the hips. J Bone Joint Surg [Br] 1997;79-B:969–971. 10. Haidukewych, G. J., Rothwell, W. S., Jacofsky, D. J., Torchia, M. E., & Berry, D. J. Operative treatment of femoral neck fractures in patients between the ages of fifteen and fifty years. The Journal of Bone & Joint Surgery, 2004 86, 1711–1716. 11. Garden RS. Reduction and fixation of subcapital fractures of the femur. Orthop Clin North Am. 1974;5:683-712. 12. Liporace, F., Gaines, R., Collinge, C., &Haidukewych, G. J. Results of internal fixation of pauwels type-3 vertical femoral neck fractures. The Journal of Bone & Joint Surgery, 2008. 90: 1654–1659. 14. Bosch U, Schreiber T, Krettek C. Reduction and fixation of displaced intracapsular fractures of the proximal femur. ClinOrthop RelatRes.2002 ;59-71. 18. 1, Sprague SA2, Scott T3, Bhandari M2; Complications following young femoral neck fractures. Injury.2015. Mar;46(3):484-91. 19. Stiasny J., Dragan S., Kulej M., Martynkiewicz J., Płochowski J., Dragan S.ŁComparison analysis of the operative treatment results of the femoral neck fractures using side-plate and compression screw and cannulated AO screws. OrtopTraumatolRehabil.2008 ;10(4):350–361. 20. Upadhyay A, Jain P, Mishra P, Maini L, Gautum VK, Dhaon BK;Delayed internal fixation of fractures of the neck of the femur in young adults. A prospective, randomised study comparing closed and open reduction. J Bone Joint SurgBr. 2004;86:1035–1040. 22. 1, Keller RB, Littenberg B, Wennberg JE. Outcomes after displaced fractures of the femoral neck. A meta-analysis of one hundred and six published reports.J Bone Joint Surg Am. 1994. Jan;76(1):15-25. 24. Brown JT, Garden RS, Nicoll EASubcapital fractures of the femur. A prospective review. J Bone Joint Surg Br.1976 Feb;58(1):2-24. How to Cite this article: Gadegone WM, Shivashankar B, Chandak R, Gadegone P. The Management of the Displaced Fracture Neck Femur by Dynamic Compression Hip Screw with Derotation Screw. 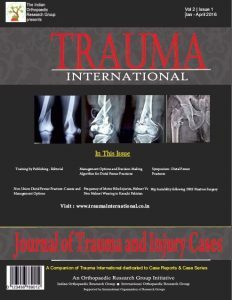 Trauma International JMay-Aug 2018;4(2):29-33.